You are here: Home / Jewelry / Brooches / Elephant Family brooch by Cartier. 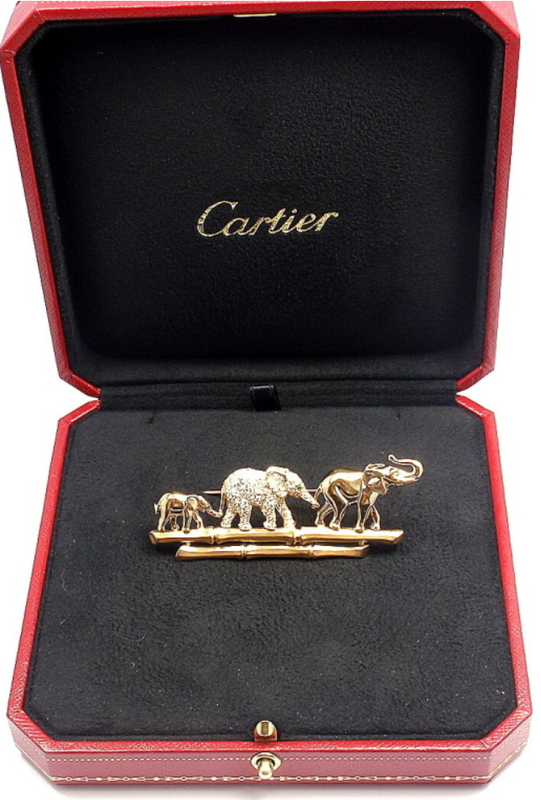 Elephant Family brooch by Cartier. I’ve decided that my general dislike of animal-shaped jewelry has three main exceptions: total absurdity, elephants, and Cartier. This brooch, which was made by Cartier in the 1990’s, features a tiny elephant family out for a tiny walk. Please note how they are adorably holding each others’ tiny tails with their tiny trunks. Each elephant has a tiny emerald eye and the central elephant (which looks like the mama, to me) is encrusted with diamonds. Also, one of them is a baby. An itty-bitty, teeny-tiny, baby elephant made of gold! I have no words. The brooch is made of 18 k yellow gold and set with 2 carats of diamonds as well as several tiny emeralds. I want to hold it in my hand and make the elephants walk around my desk. Let’s look at more baby elephants. This brooch is for sale at Fortrove, listing available via 1stdibs. Thanks to Fortrove and 1stdibs for the images and info.